Becoming Lean Part III – So Have You started Yet? Second meeting with my mentor. First question is of course - have we made progress on the tasks we put down in our plan? Well I have reviewed my CV as well as my linkedIn profile and made sure they are both up to date and that the Lean and management work I have done is clearly stated. Besides that I have written two blog post on getting Lean. Anders in turn has looked into the possibility for me to participate in som Lean project as soon as possible. One important part is the Lean Box approach that I will discuss more detailed later in this post. I am ready to do some, possibly unpaid work, in order to gain experience. We started out with a discussion on Why Lean implementations fail. A key factor is the view on leadership. The tradition western leadership is hierarchical with more important boss telling less important boss what to do until we reach the simple worker that just do wothout reflecting on why. Sometimes reflecting but beeing told to shut up and work - that has happened to me personally. The Lean thought is quite different. Everybody in the organisation is expected to assume responsibility for what they do in order for the whole team to be as good as possible. So the individual has more responsiblity for Kaizen - continuous improvement.. However most bonuses given out is for the TEAM performing well. No focus on individual excellence at the cost of producing a worse result overall! You cannot really succeed with Lean in the long run if you do not take a look at leadership style and principles. 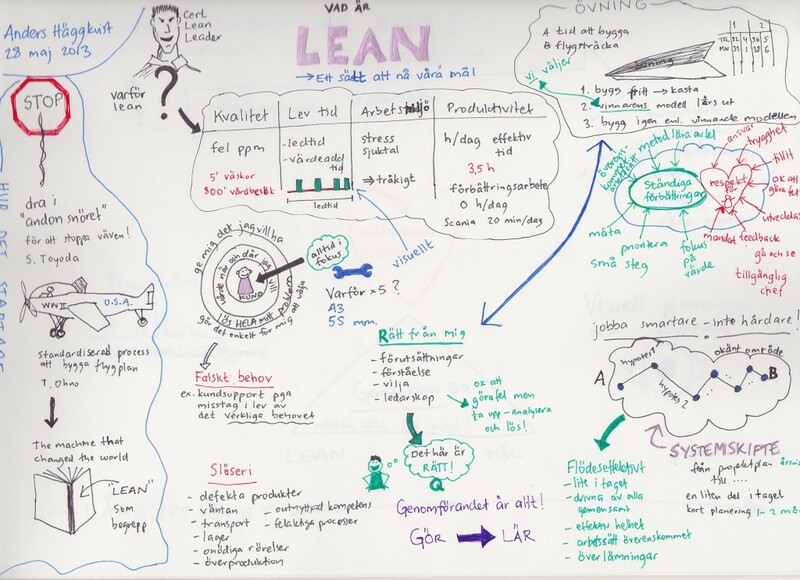 How do we convince people that Lean is superior? Well, show them tehere is another way of doing things and things can be so much better for them AND for the company. How? Start by doing a pilot and show that it works for real. What is the Deal with 6 sigma? I have read at least part of the book Toyota Way to Lean Leadership and noticed that Six Sigma was mentioned a lot of times. I had to ask Anders his thoughts on the matter. Six Sigma is a very detailed process that may work well to impove large, well used processes by analysing statistics on the usage. So most of the work we do is not that well defined, our processes vary a lot and we do not have thise huge amounts of data to analyse! So in most contexts that we work - Six Sigma will not work very well, however for some specific contexts it may work great! Anders mentioned an example with the production of wings for those huge windpowered energy works where larger wings tended to break. By analysing huge amounts of data on materials ised and production methods they were able to identify key factors for building durable wings. That said, most projects we work on have to do with changing the way we work entirely and Lean Box is a much better tool for that. Here is the short description - this fall I may be skilled anough to tell you a more detailed story. 3. vision: doing value flow mapping for a few selected processes - not too much. From wish to delivery - how much of the time is value adding activities. how much is waste? All over this we have the Lean leadership I mentioned before. Changing of attitude from management. Reallise that leadership is different but not in any way diminished in meaning. True Lean companies recognise leaders by their ablities to make individuals grow and thereby adding more value for the team effort. Improvements must come from the organisationion itself. ALL efforts to impose models on peopel that are not part of the process will inevitably FAIL! After this coaching session I feel really good. I feel that Anders wants to be a good leader and that a very important task for him is to help me improve! Also, a lot of the things we talk about I know already and am pretty good at as well (first I wrote God, I am good but not that good :-). I have worked a lot with the mapping of work processes - a large part of value-flow mapping. I love effect mapping - important part of stage 4: doing it. I have good hopes that I will add value and learn a lot about Lean this coming year. We decided to spend some four hours together, including lunch. We ended up meeting at my home for practical reasons. We, that means my mentor Anders Häggkvist and myself. Anders has worked many years with processes and the last four years exclusively with Lean. In addition he is certified in Lean – something we will come back to in a later discussion. I think I will do an interview on that subject because I am really curious to what it has given him. There are many interpretations of Lean – many of them missing the essence of the philosophy behind. Many books are written that focus on the TPS, which is production of goods. A common first argument against Lean is “But our organization does not produce goods, how can Lean apply to us?” Well at Toyota, Lean is part of ALL work, not only the production of cars. That’s why you need to read the books about Lean Leadership Tobbe! The same principles apply regardless of what you do. We are going to dig into Lean for "service providers" but not so much for factory production. One of the most important principles is go to gemba – go to the place where the work is done and see for yourself. You cannot make excellent decisions unless you truly understand the problem. We then discussed the problems many Swedish companies face when they are bought and become part of a much larger organization. Decisions start to made far away from where work actually happens. This is the opposite of Lean – instead of using the knowledge and competence of the local employees, managers far away make inferior decisions that are not accepted and thus employees leave. We see it happen over and over again. For SW development one large problem is that we are too far away from the future users. If we are lucky there is some requirements analyst that is given access to some person that represent at least part of the future users. 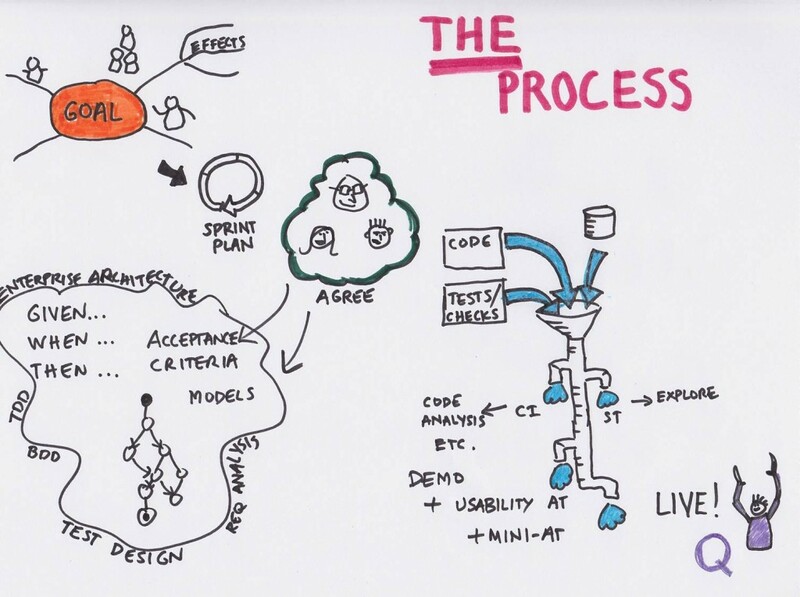 Then the analyst has to try to put all this knowledge in some – often formalized – documentation that testers and developers interpret and try to satisfy. No wonder we get unsatisfied users! Compare this to the “power of three” meeting where users, developers and testers together discuss what to build. Whenever we have these meetings continuously – the complaints during acceptance tests are almost non-existing. 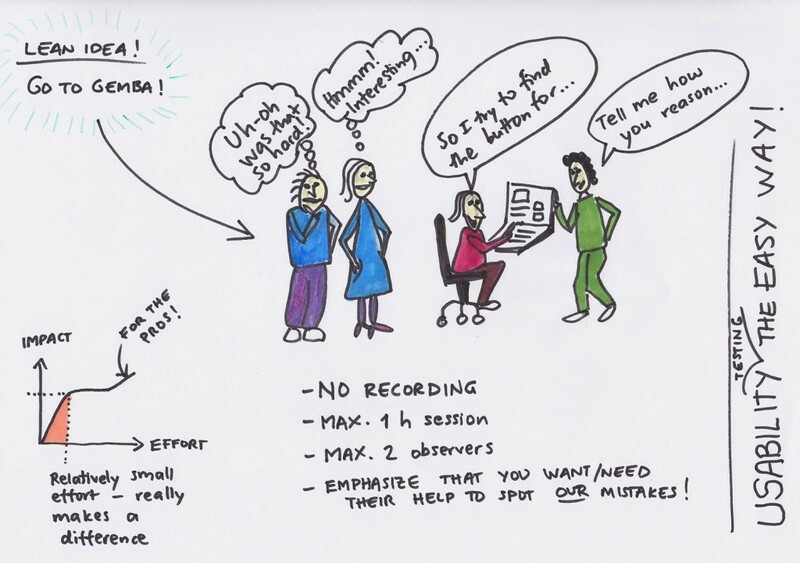 This is Lean – doing the right thing the first time, getting close to the end user. Spending a day with your customer at work can be very revealing to what their problems really are. We talked about effect-mapping (similar to impact mapping) and I showed the map I made for the current project. This is a lean tool! We often create it in a table format but the idea is the same. We use the five why to understand the root cause to a problem and also the real(root) needs of future users. Time for a lunch break with fried Pike-perch (Gös), mashed potatoes and parmesan-ream made of sour cream, white wine and lots of cheese. We had to drink water instead of the rest of the Saint Clair since some of us had to drive and others pick children up at school. In both cases smelling of wine would be less than optimal. Of the above I have updated my CV and written two blog posts. Now getting ready for next mentor meeting on Friday. Sprints are fairly short I say!